Just got my new QX7 radio and a 4 in 1 module. I looked at several videos to set this up to talk DSMX but to no avail. Configured radio and module as per info. Multi - DSM - X22 (and x11) Number 8 on the rotary switch on the module. If I use PPM mode, the FC binds but all the channels seem to pulse on there own without input from me. Got it working but AIL and ELE are reversed - in other words when I try to roll, I pitch - and when I pitch, it rolls. ??? Set the module to 0 and use the TX’s external protocol menu to select DSM. You’ll probably need to remap some channels either in the tx for that model or in betaflight. I was able to get it to go using Bayang that way, it took a bit though. Yes that’s what did it - setting it to 0. In betaflight on the receiver screen up top it will have a box with “aetr1234” in it, that’s the channel order. Change it to taer1234 (I think) and you’re golden. Alternatively, on page 5 or so of model setup on the TX you can set which inputs feed into which channel, and map it that way. Personally I do it in betaflight, but one way isn’t better than the other or anything. Enjoy your new radio! I really like the taranis units I’ve used. Thanks Bob! I’d rather do it on the radio than in BF. I do have TAER1234 selected but doesn’t seem to correct the problem. Ok - Figured it out and so far so good. swapped AIL and ELE on page 5 and also assigned AUX 1 and 2. Yeah there’s always something to do, lol. I think there’s a scaling option in the TX too, but I don’t know where as I haven’t had to use it yet. It’s arguably a little better to adjust it in the TX if you can, but I don’t know that the difference is noticeable. Yeah - updating the rxrange values in CLI did the trick. Amazing that even though the multimodule/QX7 combo works flawlessly, the setup procedure is definitely not ready for primetime. I love it - The gimbals are superior to those of the DX6i - Switches galore. Once you get past the STEEEEP learning curve, it’s only limitation is my imagination. I kinda don’t care for the dual antenna look - I’d rather the module share the host antenna than kludge another out of the back. I highly recommend this unit even though I haven’t discovered 3/4 of what this thing can do. @Bobnova - Thanks man for pointing me in the right direction. Awesome! Glad you got it going and glad you like it! I prefer to adjust travels on my TX instead of messing with rxrange in cli. Thanks @chrisdo - I’ll try it on my next build. As of now, I did do the rxrange on CLI for all my current models and it really wasn’t too bad. I don’t know if it’s the placebo effect, but I really love this QX7! To me, it feels so much more precise and predictable than my previous TXs. FWIW No, I don’t work for them nor do I get a commission but I’m just so stoked at how much of a “feel” difference I get vs my old TX that I just can’t help it. I’m most happy about the fact that my 6mm BOSS feels even more locked in and predictable. I just picked up a QX7 as well, I really dig it so far…but was bummed to realize I can’t bind it with my Inductrix. I didn’t realize there was a module that would allow me to do this! Would you mind sharing where I could find the module? I’d like to give it a shot. @Drew, I got it from here. I got the “plus” vs the original just because I thought it was more updated - come to find out thanks to @Bobnova that the little rotary dial just stays at 0, so basically its superfluous on the QX7 since it is programmed and bound from within the TX. Otherwise, it’s rock-solid. Only US$38.99, buy best irangex irx4 plus 2.4g cc2500 nrf24l01 a7105 cyrf6936 4 in 1 multiprotocol stm32 tx module with case sale online store at wholesale price. Looks like the “regular” version is a couple bucks cheaper - maybe I’ll check that one out. Is there no need to flash a special version of OpentX to use the software for changing protocol? I remember having to do that on my Taranis in order to use the software to change instead of the hardware buttons. I have a different multiprotocolmodule though. Oh wait now I remember it is now integrated into the newer versions of OpentX if I remember correctly! Sorry @JBFPV for not responding sooner - totally missed your question. 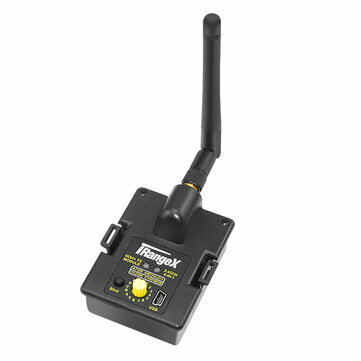 Out of the box, the IRX4+ communicates thru PPM. You turn the rotary switch for the desired model and bind by holding down button when turning on TX. If you want 100% SBUS integration, you have to update the OpenTX to the latest rev level - I believe it is 2.2.1. Once you update, just leave the rotary switch at “0” and set everything up from within the TX. At this point, the IRX4+ switches don’t do jack, so I’d say that the non “+” would work the same. There is so much to learn on this TX, I’m sure I’m not using it to its full potential and the things that I would like to program - I can’t figure it out - yet. I hope my response was still useful to you. What is you p.12 labelled? Could i have more pages 'cause i didn’t check “noheli” for the firmware-compilation…? Thanks, I have a different module but I remember back in the day you had to flash a special version in order for that to work. But later, it was adopted into the standard OpenTX versions.